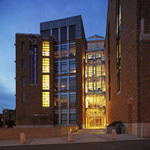 Dedicated in October 2003, the Paul G. Allen Center for Computer Science & Engineering has taken University of Washington Computer Science & Engineering to new levels of impact and excellence! The architecture of the Allen Center provides a warm and welcoming work environment for students, faculty, and staff engaged in computer science research and education. 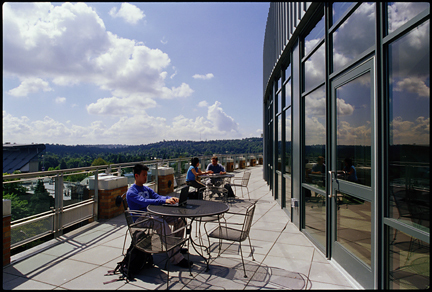 The Allen Center has become the model for new computer science buildings nationally as well as for other buildings on the UW campus. 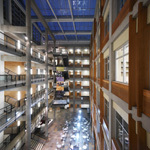 A people-centered building, with collaboration spaces, meeting rooms, and amenities, including a large atrium with 6-story high skylight and a cafe. The atrium and its walkways connect the Allen Center to the Electrical Engineering building and the EE department, whose main office also shares the atrium. Designed by LMN Architects. General contractor: M.A. Mortenson Company. 160,000 sq feet (gross), 85,000 sq feet (net). Groundbreaking took place in autumn 2001, occupancy in autumn 2003. 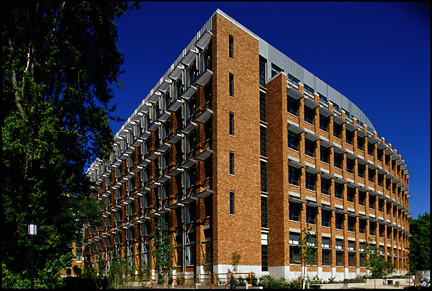 Dedication of the Paul G. Allen Center for Computer Science & Engineering, October 9 2003: Opening the Doors to Our Future!